Beautiful Ibiza style villa in Moraira with sea view and within walking distance to the village.This villa is divided over two floors and has six bedrooms, five bathrooms and two swimming pools of which one with jacuzzi.The ground floor is a completely independent apartment with three bedrooms, two bathrooms, a living room with open kitchen, private terrace with swimming pool, parking space and entrance.This makes the villa ideal for large families with independent children, for grandparents and holiday rental.The upper floor has three bedrooms with en suite three bathrooms, a pleasant size living room with sliding doors to the terrace, a separate guest toilet, American kitchen with bar and adjacent a spacious open dining area.You will not be short of storage space! There is a separate utility room with large builtin closets for storage, and via the rear of the villa there is an additional hobby / storage room.There are several terraces around the swimming pools with sea view and a spacious roof terrace for lounging.There is gas central heating and hot and cold air conditioning throughout the villa. There is a preinstallation for warm water supply through a boiler if preferred.All bedroom windows are equipped with mosquito nets.There is a descaling machine for all the water supply.The entire villa is wheelchair friendly. This is a great villa with lots of possibilities. Finca with flat land 10 min walking to the beach in la Fustera, Benissa Coast, on the beautiful Costa Blanca.The property is ideal to run a B&B, as there are 2 guest studios in the house. superbe plot with olive trees, almond trees and a very private pool with a forest behind. seaviews from the first Floor, where we find the main living area with big dining area, livingarea with fireplace, open plan kitchen, and 3 bedroom, 2 bathrooms, laundryroom and access to the huge parking areas for 8 cars. The property is very scheduled located and in distance of 800 m to the sandy beach. In future it will be diffult to find a villa with such a big plot so close to the beach. 5 min driving to Calpe long sandy beaches and huge quality of every class of restaurants up to 3 stars Michelin restaurants. Top Property. Hotel for sale in Denia-Oliva region, Costablanca north. Bio construction Eco friendly hotel with wind and solar energy. Organic garden and recycling water. Farm and playground. 9 room in main building and 5 separate modern apartments. Swimmingpool is 145 sqm. Restaurant for 60 people + 30 in the terrace. Quiet and comportable hotel only 2 km from one of the best sand beaches in the coast and a 18 hole beach golf course with horse back riding. Next to a natural park. The motorway access to Alicante and Valencia airports is only 5 km away. New shoping center and new modern hospital are also five km away. 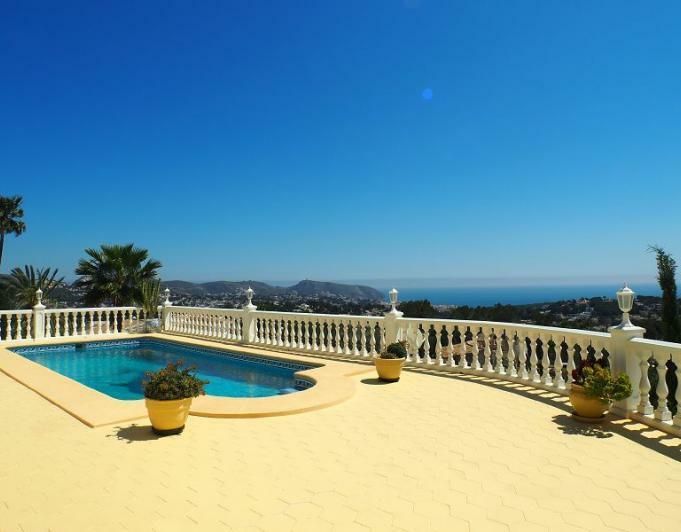 Villa with panoramic sea views in Benissa-Moraira. 2.000 m2 plot, 180º panoramic sea views from Moraira to Calpe Rock. Rare and harder to find every day this property enjoys total privacy and is south facing and very sunny all day long. The property has an entrance hall, large living room with sea views, reading area, dining room with stunning sea views, kitchen, master bedroom with en-suite shower room as well as a double bedroom and a shower room. Also found on this floor an uncovered terrace. Downstairs in the lower level comprises a living-dining room (currently used as wellness area with jacuzzi and sauna, kitchen, two double bedrooms and a shower room. Large pool terrace with plenty of room for entertaining with plenty of privacy, the mature garden with flowers and greenery all year around. Garage, parking for several cars, outdoor shower, bbq, fenced plot, air conditioning, central heating, new electric system & plumbing, as well as double glazed white aluminum windows. You can sell part of the land as a building plot. All paperwork is done. Luxury villa in Mediterranean style located in Moraira in a very good residential area with panoramic views of the bay and the marvelous sports port of the village of Moraira, a picturesque former fishing village on the Costa Blanca, which has become famous for the international upmarket tourism on the Costa Blanca North.The villa has a generous living space of 187 m2 in the upper main living floor, which can be entered without steps from the entrance terrace and the garage. Living room and pool are on a level and from all 3 bedrooms and living rooms you can enjoy the wonderful panoramic seaview. Next to the living area there is an open plan luxurious kitchen, with a covered porch, summer kitchen and sitting area in the shade. An extremely comfortable outdoor staircase leads to the lower floor "Semisotano" with 266 m2, in which there is a guest area with another two bedrooms, bodega, office and storage and hobby rooms, with windows and a separate entrance to the villa as to use an ideal family home. In addition, 72 m2 garage and technical rooms.There is also a chic conservatory cottage in the garden. The sea view is breathtaking and the quality of the building is outstanding. A dream property in Spain on the Costa Blanca. Plot with sea views in Javea for sale. This plot is 1.900 m2 + 560 forrest you can only access from the property. The price includes project and licence. The project is for a 300 m2 house but you can build up to 650 m2. 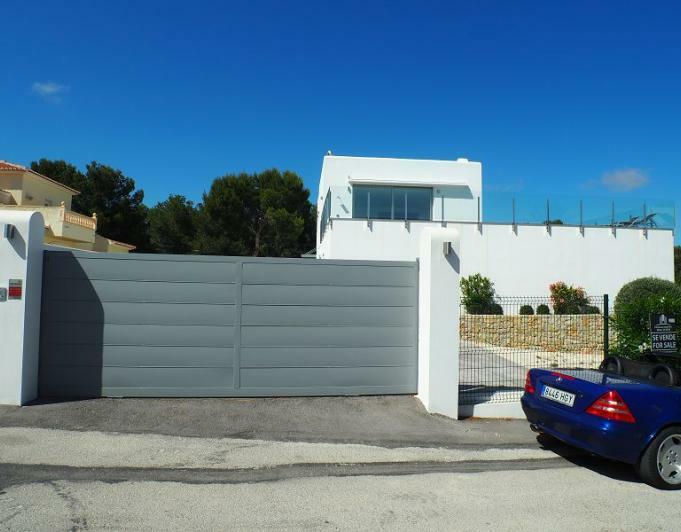 This property is geting many enquiries because there are not many urban plots with sea views in javea for sale. We recommend a quick viewing to avoid disappointments. Authentic, rustic traditional Mediterranean style, situated on a large plot of 3500m2 with fruit trees and garden area; It is just a five minute drive from town.This property, of 350m2 is very private, overlooking the Montgo, it is an absolute gem of traditional style of Jávea. Preserves traditional elements with wooden beams, Tosca arches, terracotta floors .... It features an interior courtyard and covered terrace by the garden. On the ground floor there is a spacious living room with fireplace and dining room, kitchen with access to one of the terraces; another patio with barbecue and summer kitchen, storage room, a bathroom, and a spacious and bright ideal for winter days living room. On the top floor is the master bedroom with dressing room, three bedrooms and two bathrooms. Sea view plot in the Moraira with great views of the sea and the Yacht Club. South facing building plot in an exclusive area near to town, beach and restaurants, supermarkets, shops and other amenities. Finca for sale in Denia, in a unique location, sea views, next to Denia city center with panoramic views over town and port. The plot is a entire hill with 20.000m2 with mediterranean forrest and there is a 250 m2 villa and a second house with 140 m2 both need to be restored..
First line on the beach of Las Rotas, facing the Trampoli and 100 m from the sea, is located this magnificent House of 416 m². The house has been completely renovated in the year 2017. It consists of two floors: on the ground floor is a large living room with exit to the terrace and swimming pool, dining room, kitchen, two bedrooms, two bathrooms, laundry and a beautiful staircase to the first floor distributed between four bedrooms, a small kitchen, dining room and a beautiful terrace with views. All rooms are very spacious, each bedroom has exit to the terrace and air conditioning. The House is designed for a comfortable stay of a large family or hotel operation. It has swimming pool and BBQ. It is surrounded by green splendor with the breeze from the Mediterranean Sea in the best area of Denia and just 3 km from the Centre of the town. Modern Villa with high finishing in the prestigious area of San Jaime in Moraira, which offers nice seaviews and a quiet location.The luxury villa is built in 2015 and offers in the first floor the main living area with the kitchen and the poolterrace, in the lower level are the bedrooms and bathrooms, and laundryroom. This luxury villa in Moraira is for sale and fullfills the dream of a medriterranenan Villa of luxury setting with panoramic seaviews and alto standing features. To buy a Villa in Moraira means to fullfill the dream of a villa in a beautiful setting of a mediterranean fishervillage focussed on the european tourism with green charakter and beautifiul sandy beaches with cristalline water and bays with secluded charakter. This luxury villa gives the base to be in a priviliged urabnisation where lots of european resdents live all over the year, specially in the winter, when the mediterranean lifestyle is a privilige to live and not in the cold nothern european long winters. The villa has 2 spacious storys with inside connection and on the poollevel is another guest apartment with 2 bedrooms. This spanish style Finca is a histrorical place which was totally reburbished 7 years ago. The Villa is in the heart of the beautiful mediterranean Town Javea on the Costa Blanca, with a prot and famous sailing club. The historical old town is in walking distance with shops and restaurants. The Finca is totally scheduled with garden of more than 4000 m2 around the house.unique property with high Quality materials and style. 2 annex guesthouses make the villa ideal for rentalbusniess or B+B.The main house is composed of living room, kitchen with dining room, cellar, master bedroom suite with dressing room, patio, living room with fireplace, guest toilet, entrance hall and porch. total area 650.40.Guest housing composed of living room with fireplace, three bedrooms, kitchen, porch and laundry. total area 183.70 m2 annexed housing composed of living room, kitchen, two bedrooms, bathroom and porch. total area 65.40 m2 outdoor garage with automatic gate of 50.0 m2, four storage rooms of 29.40 m2, pergola of wood of 12 x 5 mts. Unique property with uique location. Price promotion up to Eastern 2018! Luxury Villa in Benissa located on a plot with wonderful open mountain views. This Villa is very close to the Mediterranean Coastline and only a short distance to the town center which offers many choices of bars, restaurants, and local shops. The huge windows of this Villa offer nice views of the pool and the landscape, the entrance of light has been optimized to maximize the comfort. This villa has six bedrooms and 5 bathrooms, two spacious living rooms, two kitchens, a big fireplace, pool table, Jacuzzi, barbecue, an indoor cinema and a big and beautiful garden with swimming pool. This villa offers all the necessary amenities and comforts for a quiet and private life.